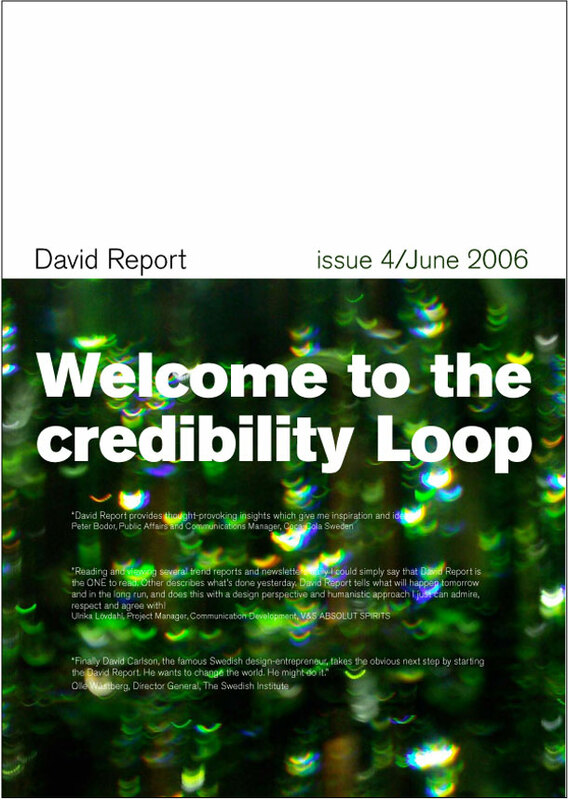 Introduction to the Welcome to the Credibility Loop trend report. Today advertising is a questionable effort both to build recognition and to build a brand. The academic elite as well as business professionals have a second thought how to do. It’s all about building a trustworthy and reliable partnership with your (future) customers. To become a part of their mind so to speak. And when most people are sick and tired of all advertising everywhere, there must be a better way to communicate with them, mustn’t? We think it would be smart if more companies would start to question the advertising standard. After our discussions about plagiarism and copying in David Report issue 1, Supreme regionalism in David Report issue 2 and how to design the future in David Report issue 3, we will now continue with another very interesting subject. During a long time we have wondered why so many excellent business executives have such a trust in advertising, and we deeply challenge if that enormous amount spent on advertising couldn’t be spent more useful? Today advertising is a questionable effort both to build recognition and to build a brand. The academic elite as well as business professionals have a second thought how to do. It’s all about building a trustworthy and reliable partnership with your (future) customers. It’s to become a part of their mind so to speak. And when most people are sick and tired of all advertising everywhere, there must be a better way to communicate with them, mustn’t it? In the old world we went to school to get information, we trusted legal and other authorities and we consumed advertising as entertainment. Most people at the age 30+ remember a time when everybody arrived to the cinema ten minutes before the movie started just to see the commercials. Today we get information nearly everywhere. We question authorities as they serve the system, not the people, and advertising has become or soon will be the most unreliable kind of information. Advertising is one-way communication and today the consumer want and demand interaction. We are getting more critical, well-informed and we want to search and find information ourselves. It’s more or less a rule that we frequently ask friends or small communities/subcultures about references; we certainly don’t believe an ad at page 3. The advertising industry has for a long time produced low-refine but over-paid material, and this will not be possible in the future. We all know that in today’s media buzz it’s hard to get your voice heard, and one more advertising campaign is not the best solution to get you through the noise. It’s the phenomena of advertising itself we question, and all the (in all other senses) smart business men/women that are holding yesterdays advertising culture under their wings. There are lots of examples that advertising doesn’t boost sales. So why do we still have a culture of an “advertising-landscape”, with expensive ads that do not generate what they should generate? Which fundamentals are used for setting up a media budget? We can only speculate, but we can certainly say that the psychological impact is heavy. The hunger for safety and the fear for failure are stronger than questioning what’s done before and the outcome of it. An expensive and unsuccessful advertising campaign can’t be justified due to financial or rational arguments. But with emotional and psychological reasons this often happens. What we are seeing is a global mass psychosis where a group of companies (advertising agencies) with success are selling a product much overrated. How could this happen? Has advertising turned into a very expensive insurance premium? The perception of the recipient has changed. With Internet, and in some parts the globalisation (from a positive point of view) people today have a unique possibility to question the power of advertising. Yesterday it took days or months to spread information that today only takes a second. Nowadays people prefer to get their values, impacts and advices directly from search engines on the web, from friends, influent sub groups or editorial press. An example: If you going to New York and want to stay at a really special hotel, would you check the hotel ads? Not likely. You rather ask a friend or read the hotel reviews. Very few would trust the hotel ads: they are subjective and only deliver the hotels message. How trustworthy is that? Some companies advertise for more than some countries GNP. One trillion, or one thousand billions (1 000 000 000 000) US dollars, low estimated, was spent on advertising in 2004 worldwide. Only in the US it was spent at least 500 billions (Procter & Gamble spends most: 2,9 billions). Compare this with the 1.1 trillion dollars (1 118 000 000 000) that was spent 2005 worldwide on military expenses, or is this reasonable for something that Al Ries, the US marketing strategist describes as “…advertising’s dirty little secret: it serves no useful purpose”? We would like to challenge the GNP facts above with a holistic and humanistic question; how many starving people, which amount of animal species under threat of extermination and how much rain forest could be saved with just a fragment of this money? An interesting and very important discussion, but in this issue we have decided to concentrate on the business part of the situation. We have an alternative to today’s advertising-landscape as we think it’s more appropriate to create trustworthy communication and brands by development of new products and services. It’s all about creativity, innovation and design. We call it The Credibility Loop. We proudly present an interview with Viggo Cavling, editor of Resumé, the Swedish leading advertising magazine. What about the future of the communication-field? What tendencies do you see? What will be most important? Clarity, of course, commitment, and that the costumer is satisfied and recognise himself. Will traditional advertising/ads work in the future? If, why? If not, what will replace it? Traditional advertising will always work. Some products will always work best with conventional repetitive carpets of bombs. But we will see a future where the most successful has a unique contact between company and customer. Online you can be intimate, unique and very personal. But not all products works selling online, furniture is difficult I think. What about the future for the advertising business? What changes will come? Internet and the mobile phone will grow into one item, as a kind of mini-machine that we always carry around. We will always be online – 24 hours a day. The advertising must be both clearer and more invisible. It should only be seen where it’s desired, such at Google. It’s about finding more “googles” and for us in the media field to innovate and maintain them. How would a clear design strategy affect the future of the communication field? The designer’s task is to visualise the engagement and the feeling. The very same signals must be found everywhere. Without strategy or a plan you are lost. As everything constantly change around you, you must be sure who you are and where to go. Yup, it’s true. There’s a whole lot of advertising out there. If you watch TV it feels like there’s almost more advertising than actual content. It turns out to be a program of commercials with a little bit of TV drama thrown in. Even the average person probably doesn’t realise just how much advertising is out there because it has taken on so many forms other than the more traditional overt forms. Watch TV or a movie and there’s product placement everywhere. Open a magazine and there are advertorials, or in Japanese magazines we have ‘tie-ups,’ whose very purpose is to conceal advertising as actual content. In Japan there has been boom in recent years in the number of summer music festivals. This summer there will probably be 30 or 40 different music festivals. And why are there so many? Because companies have discovered that these are a great way to communicate with an audience, like an interactive advertisement. Though it’s overwhelming to think about how much advertising is out there, it’s not going to disappear, but the methods of communication will probably change. The golden age of advertising, when ads served to entertain as well as re-educate the public about consumption, is over. What will come next? Maybe honesty. Surprisingly, some Japanese electronics brands have found this approach to be useful. Some of these companies are using advertising to tell the public about the dangers of some of their older products and having a very positive effect on the company. In the past, in Japan, it was pretty easy to make advertising and know how the public was going to react. Today, there are so many segments in the market, so many that it isn’t even easy to describe who they are, that companies don’t seem to be sure how to tailor ads to communicate with the public so they just blanket the country as best they can in the hope of catching a few people. Anyone who has been to Tokyo has probably noticed how every corner of the city is covered in advertising. It’s like a battlefield of advertising. It’s hard to imagine cities without it. Even if all the buildings in a city fall down probably the advertising would still be standing. You need an arsenal of hygiene factors just to be on the market nowadays. All competitors have good quality, good service, good distribution, good personnel, good price, good communication and good whatsoever…At Sony there is a saying that all products have the same function, performance, technology and price. The only thing that differentiates their products from their competitors is design. Why not putting most efforts in developing good design then? Up to today the marketing people have been in charge for entering new products to the market, and this (only) because their job is to know what people like and want. But do they really know what people need? It’s more interesting to see what people are doing instead of listening what they are saying. Look at your children; they do like you do, not like you tell them to do. And Henry Ford would probably got the answer “faster horses” instead of “a vehicle with a motor on four wheels” on a direct question about peoples’ needs. We think the marketing people quite often have the same narrow-minded thinking. A lot of them don’t see beyond existing categories and often goes for what’s already available and possible. So, let a creative design culture sweep through the organisation and combine the innovative minds from the R&D department with the outgoing ditto from the marketing department. It is only by combining different skills and mindsets you can create real innovations that give you the possibility to change the future. As you can’t win the advertising battle – go for a ride with the Credibility Loop! Let the products talk themselves. Give them a raison d’étre, personality and a soul! It’s probably the best way to differentiate a product offer. And out of a strictly financial point of view: what are the reasons not produce products that communicate efficient itself? Why not transfer money and efforts from the end (advertising) to the start (R&D) of a product life cycle? By doing this companies can be much more innovative and it will give them the possibility to build-in communicative qualities into the products from the start. And by giving products and services a better meaning, the chance is much greater that the target group will source them voluntarily. A good example: When iPod was introduced year 2001 Apple spent 24,5 million dollars to launch the product. A huge amount of money, but still probably just a tenth of how much the cost would have been to reach the same global success with a less attractive product. Good design and word-of-mouth did most of the job. Design = Economy as the great Swedish graphic designer Olle Eksell described it already back in 1964. Finally: It’s all about taking charge of the situation. We are certain that companies will build a much more credible brand with good design and innovation strategies instead of only wrapping up the products with ads in the end. The advertising money is much better used for innovations that makes a difference and that benefit both business and society. Who doesn’t want to make peoples life better, more equal and hopefully happier by developing more attractive and sustainable products or services? Some may argue that everything will be copied: product or service. Of course it will, if it’s successful enough. When everybody has the same technology copies will always exist. So you have to differentiate and be unique, you need to be smarter and pro-active. A good way forward is to be less technocratic and more pro-cultural, because the cultural values of a corporation are the most difficult part to blueprint by the copycats. By having an integrated design strategy within the corporate strategy (together with marketing, HR, R&D, finance etc.) you will come very far. We are all familiar with the discussion from the eighties and forward about brands: “Our brand is our most valuable asset”. Today it’s common talks, and a hygiene factor. Nowadays the design strategy is the “new” brand strategy. Successful companies with a clear design strategy like Apple have understood that the design issues must be discussed and decided at the highest management levels. A design strategy should have its tentacles everywhere in a corporate strategy, that’s why it’s necessary and an unbeatable competitive advantage. It’s beyond corporate identity and graphic design questions; it’s about everything that happens in your company. How does your customer service respond, do you have fresh flowers and fruit in your office, what kind of music is played in the reception, is your logistics fully optimised, how is your product or service packed and how do you expose it? Everything counts, nothing is unimportant, you have to have holistic view and manage the process – the design process. It’s your most important process, because design helps you to succeed with your communication. And with good communication you will reach out and become a happy and hopefully positive part of your costumers’ minds. To summarise the everlasting brand discussion: A brand and its value is the outcome of a design process. Today we all know that we have to develop, innovate and find new ways to survive – either it’s business, personal or environmental concerns. At David Report we take our responsibility and focus on a business dilemma – why advertise when you can do something more powerful and actually both build your brand and sell more products/services by innovative R&D? As you read above we argue for a shift from advertising into a design focused R&D. According to us this is the only way forward into tomorrow’s society and business life. Design is also the best way to visualising your brand and your business strategy. Be smart, question the advertising standard and go for a ride in our credibility loop, or in other words: build your brand through a smart design strategy. 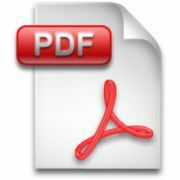 We would love to get your comments on this issue of David Report. David Carlson is the founder of David Report, Designboost, Carlson Ahnell and David Design. His social life reflects as well the principle of a cross-pollinating mindset. He’s president of a nature conservation organisation, he has been playing guitar in bands since the early 80s, most recently with the Miller Moon and last, but not least, he holds a deep dedication to gardening, and more specifically, old roses.